Since it is nearly impossible to determine a maximization strategy for Social Security on your own, we utilize sophisticated software to analyze all of your possible strategies and provide you with a written step-by-step strategy for maximizing your Social Security benefits. While our software automatically renders a primary solution, you may have more specific financial goals, such as getting the most in survivor benefits or maximizing joint benefits. Our Social Security software has the ability to compare claiming strategies based on such goals. Many people are unaware how Social Security benefits are taxed, and the rules are complicated. If you have income other than Social Security, including income from a pension, withdrawals from a 401(k), or investment income, taxes may be owed on up to 85% of benefits. Our Tax Calculator makes it easy for us to calculate the taxes on your Social Security benefits and view the impact of those taxes on your benefits over time. Keeping a focus on the after tax bottom line is critical. 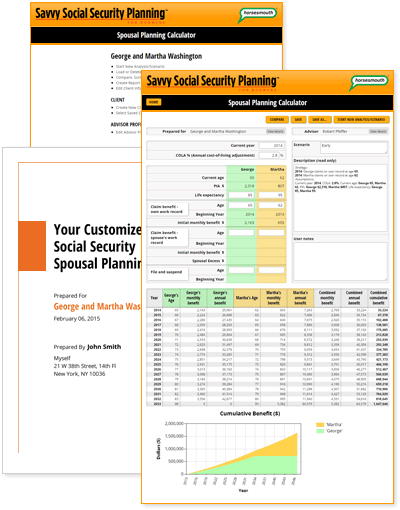 To enable you to easily implement your Social Security maximization strategy, we provide you with a written analysis complete with step-by-step instructions. Call us today at 563-359-3475 to schedule your complimentary review.